A memorial cross and honour roll commemorate the men of the 19th Infantry Battalion who died in service or were killed in action during World War One. The cross was erected in memory of the men of the Battalion who were killed at Pozieres in 1916 while the panels contain the names of all members of the Battalion who died in service or were killed in action in World War One. 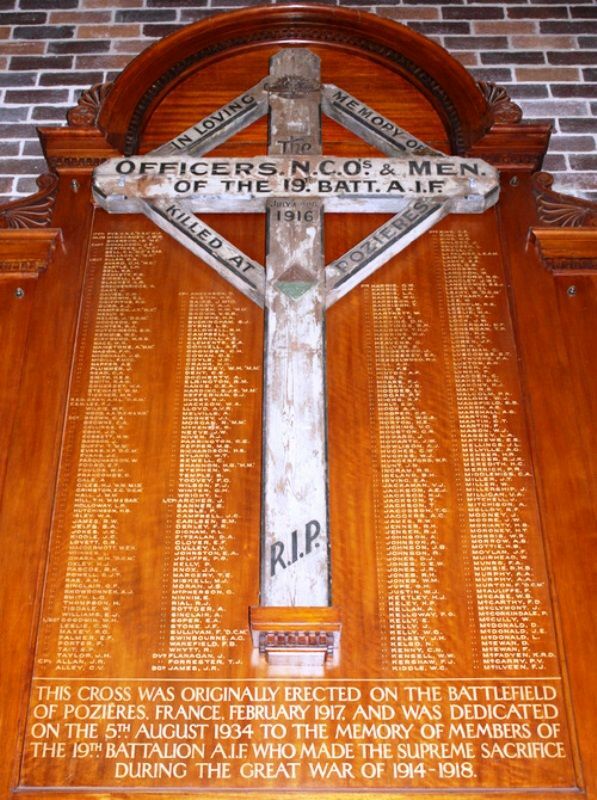 A memorial cross brought from Pozieres and memorial panels bearing the names of 879 members of the 19th Battalion, A.I.F., who were killed in action, will he unveiled and dedicated at the Sailors and Soldiers' Memorial Church of St. Luke, Clovelly, tomorrow afternoon. The panels form a background for the cross. The Sydney Morning Herald (NSW), 4th August 1934. This cross was originally erected on the battlefield of Pozieres, France, February 1917. And was dedicated on the 5th August 1934 to the memory of members of the 19th Battalion A.I.F. who made the supreme sacrifice during the Great War of 1914 - 1918.